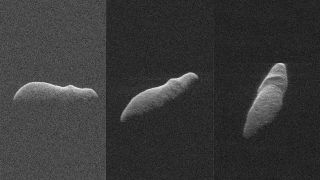 These three radar images of hippo-shaped near-Earth asteroid 2003 SD220 were captured between Dec. 15-17, 2018 using NASA's Goldstone antenna, the Arecibo Observatory in Puerto Rico and the Green Bank Telescope in West Virginia. If only a hippopotamus will do this Christmas, Santa has the space rock for you. A small asteroid will fly safely by Earth Saturday (Dec. 22) and according to the folks at NASA, it looks just like the mighty hippo in new radar images. The asteroid, called 2003 SD220, is also making its closest approach to Earth in more than 400 years and won't be any closer until 2070, NASA officials said. It last flew by Earth on Christmas Eve of 2015. The radar images were taken between Dec. 15 and Dec. 17 by scientists with NASA's JPL, Goldstone antenna in California, Arecibo Observatory in Puerto Rico and the National Science Foundation's Green Bank Telescope in West Virginia. The Goldstone and Arecibo instruments bounced microwave signals off the asteroid that were then picked up by the Green Bank Telescope to create detailed radar images of the rock's size and shape. These two radar images of near-Earth asteroid 2003 SD220 were obtained on Dec. 18-19, 2018 using the Arecibo Observatory and Green Bank Telescope. The asteroid looks much like a hippo wading in a river, NASA says. "The radar images achieve an unprecedented level of detail and are comparable to those obtained from a spacecraft flyby," said Lance Benner of JPL in Pasadena, California, lead scientist for the Goldstone observations, in the JPL statement. "The most conspicuous surface feature is a prominent ridge that appears to wrap partway around the asteroid near one end." The ridge rises 330 feet (100 meters) above its surroundings, and the asteroid is pepperd with bright spots that may be reflections from boulders, Benner said. "The images also show a cluster of dark, circular features near the right edge that may be craters," he added. The new observations are about 20 times more detailed than those taken in 2015, when asteroid 2003 SD220 last flew by Earth. At the time, it was much farther away than on its current visit, NASA officials said. The new images also confirm key details about asteroid 2003 SD220, NASA added. They show that the asteroid rotates just once every 12 days - an oddly slow spin for a space rock. It also has a wobbly motion that NASA officials likened to a badly thrown football (or perhaps a meandering hippo?). Older images of asteroid 2003 SD220 taken by the Arecibo Observatory in Puerto Rico during a previous flyby in December 2015. "Known as 'non-principal axis' rotation, it is uncommon among near-Earth asteroids, most of which spin about their shortest axis," NASA officials said of the asteroid's motion. By refining asteroid 2003 SD220's rotation, size and shape, the new radar images will help scientists understand how it formed and evolved over time, researchers said. The observations were funded by NASA's Near-Earth Object Observations Program, which regularly tracks potentially dangerous asteroids for the Planetary Defense Coordination Office that oversees the agency's Planetary Defense Program.